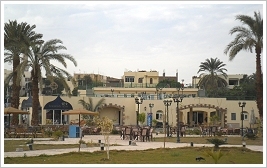 Since December 7, 2009 Luxor is an autonomous governate of Egypt. 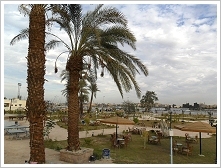 Before it belonged to the governate of Qena. The new governorate includes 3 markazes (districts), 4 cities, 13 rural local units, 16 villages, and 182 hamlets. 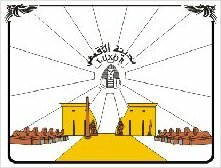 The former Chairman of Luxor Supreme Council General Dr. Samir Faraj is the new Governor of Luxor. The famous tomb of Pharaoh Tutankhamun will undergo a five-year project in collaboration with the Getty Conservation Institute to clean and restore the wall paintings. Tutankhamen’s tomb which Howard Carter discovered in the Valley of the Kings, in 1922, is by far the most visited tomb in Egypt. Heat and humidity from the thousands of tourists accelerated the process of deterioration. 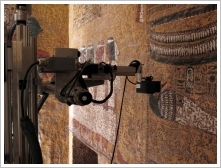 The wall paintings will not just be restored but also scanned with a high resolution recording laser scanner. It was specially designed for the Supreme Council of Antiquities recording the Tomb of Tutankhamun in order to product an exact facsimile. Prospectively, the copy will be presented instead of the orignial tomb. As of now, it hasn’t been decided whether the tomb will remain partially opened or be closed. Following "Horizontal Limits" and "Twilight Zone" "Imagine" is the 3rd cultural exchange project of 8 German woman artists from Muenster and Egyptian lecturers and students of the Faculty of Fine Arts in Luxor. 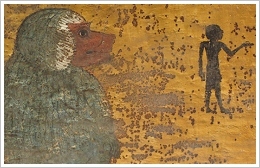 From Nov 12 to 26, 2009, their paintings, objects, and installations will be shown at the Faculty of Fine Arts in Luxor. 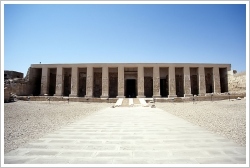 On the occasion of the Symposium "Valley of the Kings since Carter" held at the Mummification museum in Luxor the restored Carter House opens its doors for the public on Nov 4th, 2009. 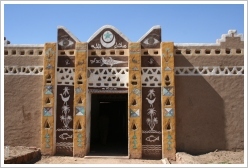 Now it serves as a museum and shows apart from personal things like books, records, and paintings also excavation tools and contemporary photographs. Exactly 86 years ago Howard Carter discovered the world-famous tomb of Tutankhamun (KV62) in the Valley of the Kings. After an accident in April, flights over the West Bank were suspended. 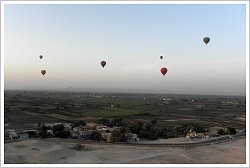 Now, six months later, they fly again each morning at sunrise - with only one balloon of each company at the same time (that means 8), all at the same place (world’s first hot air balloon "airport"), re-trained pilots, and tightened safety measures. The 188-metre-long and beautifully decorated Tomb of Pharaoh Ramses III, also known as „The Harper's Tomb“, is now again accessible to the public. 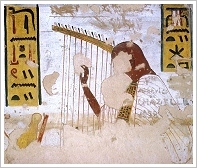 The famous harper scenes depict the crowned heads of Ramses III as part of the harps. After a year and a half of restoration, today the Abu Haggag Mosque was inaugurated. 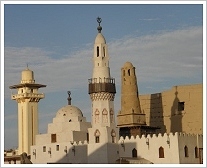 The mosque stands atop the ruins of Luxor Temple. 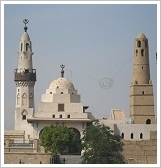 Walls of the temple decorated with ancient reliefs and hieroglyphs were integrated into the mosque, also colums. 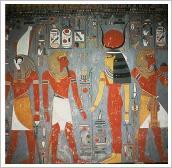 After the installation of special equipment tomb KV57 in the Valley of the Kings re-opened. This tomb is the first to have such technology installed in an attempt to reduce and control the rate of humidity and heat, which has affected the tomb’s wall paintings in the past. A specialized German organisation provided the equipment. 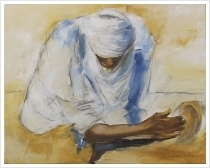 If all operates successfully it will be installed in all tombs in the Valley of the Kings. Building work at the place near to the western ferry dock is extensively finished now. The building operations included a small park with restaurant, arcades for shopping, a car port, a piece of a corniche with several accesses to the motor boats, and expansive street lighting. 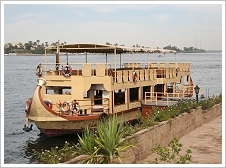 Luxor Has a New Ferry! 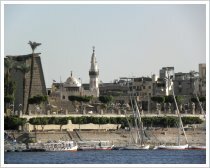 Since today, the heavy steal ships are replaced by lighter pharaonic styled wooden ships. Now, one sits not anymore sidewards to the engine, but in short rows of benches facing the engine. The upper seats are sheltered. As before three ferry boats run at the same time. Also the price is constant. Tonight, an exhibition with handiworks is opened at the Marsam Hotel, the oldest hotel on the west bank. 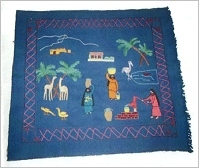 In 2007, 9 women from a poor background founded a co-operative entitled El Nur ("The light") in order to use their embroidering and sewing acconplishments for earning their lifelihood by placing their works on sale. 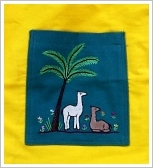 The wall hangings, bags and cases will be showcased until 2nd of April. 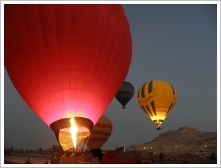 Until the 1st December travelling on the routes between Luxor and Hurghada, Luxor and Aswan, and Luxor and Abydos was just possible at definite times in police guarded convoys. For temple visits very limited time remained before the convoy went back. That's past now. You can start out whenever you want and take your time for sightings. 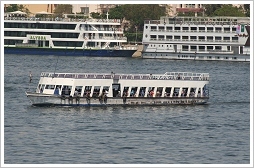 For the present, the convoy operating between Aswan and Abu Simbel persists.